Manifold dividers are useful for splitting airlines from one larger air pump or compressor. The larg..
Quality Silicon Airline to attach pumps to airstones as needed. Silicon is flexible and long lasting.. This quiet running air pump is highly efficient and has a low energy consumption. Features an adjust.. This quiet running air pump is highly efficient and has a low energy consumption.Outlets - 4 (4mm)Po.. 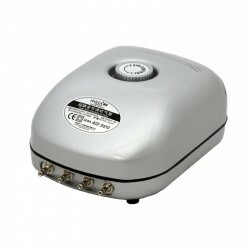 This quiet runinng air pump is highly efficient and has a low energy consumption.Outlets - 1Power - .. The LK range of BUYO air pumps have an aluminium casing for long life and good heat dissipation. Qui.. The SES range of BUYO air pumps have an aluminium casing for long life and good heat dissipation. De.. This HAILEA Super Silent Adjustable Air Pump features an adjustable output offering maximum flexibil..
High quality air diffuser that helps to increase the oxygen content of all nutrient solutions. Simpl..